Close physical human–robot interaction makes it essential to ensure human safety. In particular, the intrinsic safety characteristics of a robot in terms of potential human injury have to be understood well. Then, minimal potential harm can be made a key requirement already at an early stage of the robot design. 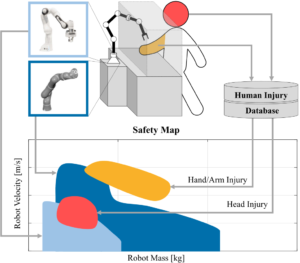 In this letter, we propose the safety map concept, a map that captures human injury occurrence and robot inherent global or task dependent safety properties in a unified manner, making it a novel, powerful, and convenient tool to quantitatively analyze the safety performance of a certain robot design. In this letter, we derive the concept and elaborate the map representations of the PUMA 560, KUKA Lightweight Robot IV+, and injury data of the human head and chest. For the latter, we classify and summarize the most relevant impact studies and extend existing literature overviews. Finally, we validate our approach by deriving the safety map for a pick and place task, which allows us to assess human safety and guide the task/robot designer how to take measures in order to account for both safety and task performance requirements, respectively.